The University of London is unlike many other universities. It consists of 18 independent member institutions with outstanding global reputations and several prestigious central academic bodies and activities. The Member Institutions are considered universities in their own right; they set their own entrance criteria for their courses and they offer their own services to students. Some now also have their own degree awarding powers. All students from all of the Member Institutions are also University of London students, making them part of a community of over 170,000 students and giving them access to many services in London. Apart from the opportunity for students to study at these member colleges, the University of London offers the opportunity for over 50,000 international students to study for a University of London degree without having to travel and reside in London. Over 50,000 students are currently studying in 180 different countries with the University of London International Programmes, and the parchment they receive on successfully completing their degree is conferred by the University of London under the academic direction of a Lead College. The University of London has a network of 80 recognised centres spanning 46 countries that provide teaching, within the University’s quality assurance framework. 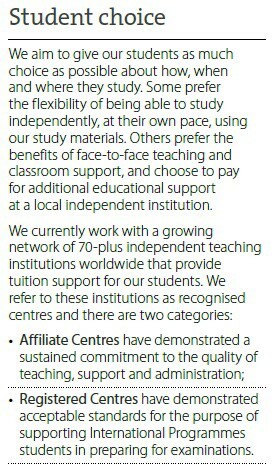 There are two categories of recognised centre: Affiliate and Registered. 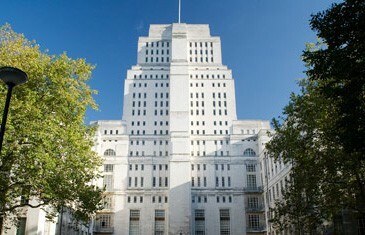 Whilst Registered Centres have demonstrated high standards in respect of teaching, support to students and administrative processes, Affiliate Centres have demonstrated a sustained commitment to developing excellence in respect of teaching, support to students and administrative processes for students reading for University of London degrees. There are 28 Affiliate Centres worldwide, with many students on undergraduate courses attending local institutions to benefit from the learning support, structure, library resources and opportunities to meet with fellow students and live a University life. It would have been pertinent of the leadership team at Saint Martin’s Institute to expect to have the ability and know-how to award degrees. The Institute has grown from its humble inception in 1985 through rigour and high competence, preparing students for public examinations. The University of London International Programmes, as an examining body of a very high reputation in Malta and overseas, was an excellent opportunity for Saint Martin’s Institute to ‘learn the ropes’ from the very best, so to speak! Saint Martin’s Institute of Higher Education joined the University of London network in the year 2000, when it started to offer the BSc (Hons) Computing & Information Systems of the University of London to Maltese students reading for the degree as evening students. Soon after, the Institute was admitted as a Registered Centre, able to accept students to read for the Diploma in Computing & Information Systems led by Goldsmiths College, University of London and the Diploma in Economics led by the London School of Economics and Political Science (LSE). This opened up possibilities for Maltese students to read for degrees, led by the LSE in social sciences, such as Accounting, Banking, Economics, Finance, Information Systems and Management. 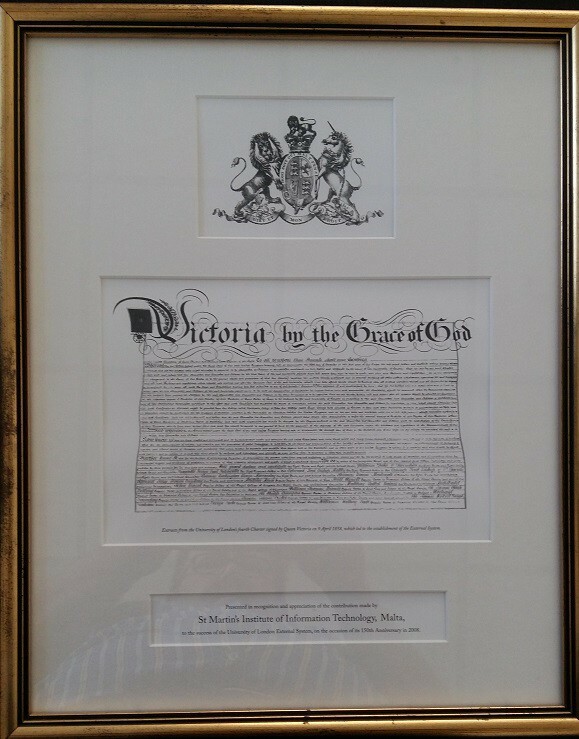 The University of London celebrated its 150th Anniversary of its International Programme by awarding 6 Affiliate Institutions in its Network with this symbolic charter as recognition of Excellence. Saint Martin’s Institute of Higher Education Received this honour from the Vice Chancellor, Sir Graeme Davies in 2006. Saint Martin’s Institute of Higher Education was challenging the status quo in Malta at that time, and started off a process by which the Further and Higher Education Act was enacted by Parliament in 2012. But before this key date in Maltese educational history, Saint Martin’s Institute had taken the plunge and started accepting students to read for a wider portfolio of degrees, conferred by the University of London as full time students. The Government of Malta supported these students by recognizing them as equal to students reading for their degrees at the University of Malta, by paying them the monthly stipend and maintenance grants whilst in study at Saint Martin’s. Since then, the further and higher education scene has experienced a massive transformation, and students are now offered a choice of licensed institutions to choose from. Plurality in further and higher education is very important for the Country because each academic institution will add different facets in knowledge and competences that will have a very positive effect at the workplace. Saint Martin’s Institute of Higher Education is an awarding body under the new legislation, and is able to award qualifications at Malta Qualification Framework (MQF) level 5 (Awards, Certificate & Diploma), level 6 (Bachelors of Science and Bachelor of Arts undergraduate degrees with honours & Foundation Degree), level 7 (postgraduate certificate, diploma and Master) and level 8 (Doctorate). To all intents and purposes, the Institute therefore is an University, except that since its span of fields is limited to the Commerce and Computing fields, it does not carry the name of University according to Maltese law. But, apart from the licensing, the most important factor that determines the academic probity and reputation, is the recently published External Quality Assurance and may be downloaded from the NCFHE website on the following link http://ncfhe.gov.mt/en/services/Pages/All%20Services/eqaa.aspx . 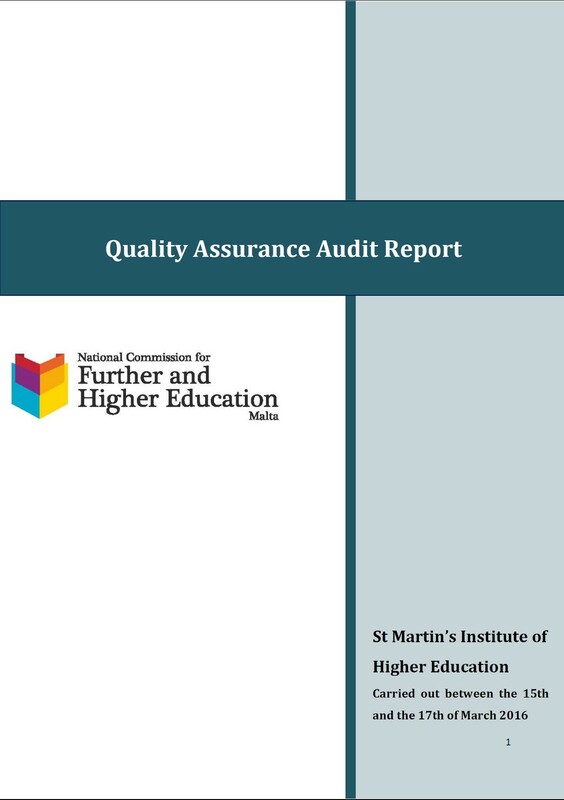 The excellent report published by the NCFHE appointed independent audit team, that consisted of members of the quality assurance directorate at the NCFHE as well as students and academic staff from the University of Malta, under the chairmanship of an independent expert in higher education quality assessments, has meant that the Institute has gained in stature even more than ever before. Not only has it performed so amiably well as part of the University of London network, but also has shown that independently from the network, it can achieve standards that surpass expectations. Saint Martin’s Institute of Higher Education believes that above anything else, an institution of learning must have the student in its focus. many further and higher education institutions lose their direction, and start diverging their attention from the core requirement to provide the student with the necessary knowledge, skills and competences that will help integrate the student as seamlessly as possible in his or her chosen career. But Saint Martin’s Institute is not simply concerned with the short term adequacy of the student upon graduation, but works hard to make sure to provide the necessary skills for the graduate to be able to take control of his or her knowledge assimilation throughout his or her lifetime. The NCFHE audit has vindicated what has been obvious all along. Saint Martin’s Institute graduates in Computing have, ever since 2005 with the very first batch of graduates, surpassed the expectations of the Institute with over 40% attaining the coveted first class honours. This, in itself, is a mark of excellence because Saint Martin’s Institute academic staff are not involved in any way or at any time, in the process of examining the student. Whilst Saint Martin’s Institute faculty members are duty bound to lecture and mentor students, the University of London through its examining boards, examines students and confers the degrees according to its own metric and standards. The extended record of such high attainment is a clear indication of the care Saint Martin’s Institute of Higher Education gives to its most important element in its existence — the student! Follow what students have to say about their experience at Saint Martin’s Institute because after all, it is they who are our best critics.